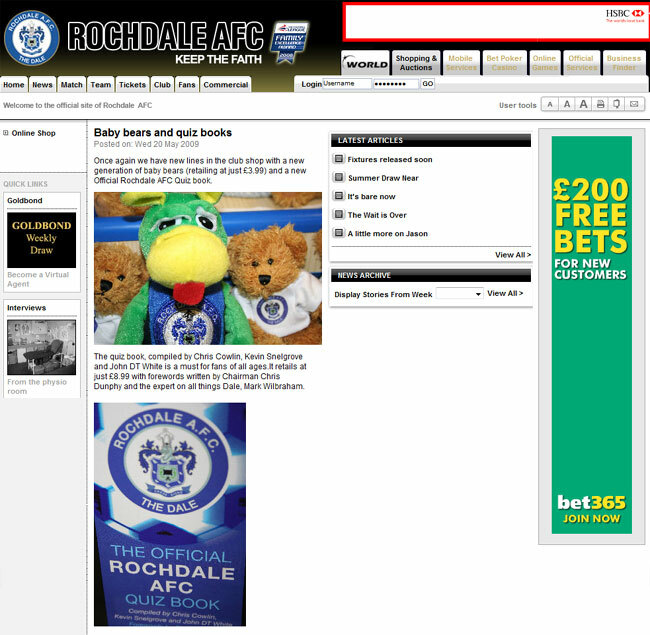 Brief Description: Are you a supporter of Rochdale AFC? Do you think that you’re fully clued up about your favourite team? 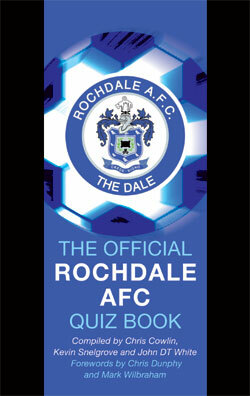 Then The Official Rochdale AFC Quiz Book will find out how much you really know (or indeed, don’t!). The 800 questions have been carefully put together to test your knowledge on all aspects of the club, from managers, players and opponents to memorable matches, scores, victories and defeats. Packed with interesting facts this book is sure to bring back fond memories of all those special footballing moments and is guaranteed to provide hours or entertainment. The Official Rochdale AFC Quiz Book can’t fail to score a hit with young and old alike. About the Author: Chris Cowlin: Chris has compiled many quiz books and has raised thousands of pounds for various charities with the sales of his books. He has compiled books on football (various clubs), cricket, the Carry On films and television. Kevin Snelgrove: Kevin was born in 1960 in Frome, a small town in the countryside of East Somerset. Kevin's first published book was 'The Official Carry On Facts, Figures & Statistics', he then went on to compile many football quiz books. John DT White: John has been a sports fan since he was able to kick a ball around the streets of Belfast. George Best was his boyhood hero and has supported Manchester United all his life. The author currently lives in Belfast with his wife Janice and his two sons, Marc and Paul. Don’t expect me to answer any! A must for all Dale fans from all generations. There are many interesting and diverse questions covering all aspects of Rochdale AFC, and to suit all abilities. A very comprehensive quiz book that will be of great interest to all Dale fans - and help to keep them entertained. I thought I knew quite a bit about Rochdale AFC but there were plenty of questions I couldn’t answer. An absolutely superb test of any Rochdale fans’ knowledge. Not just a quiz book, it’s an education! 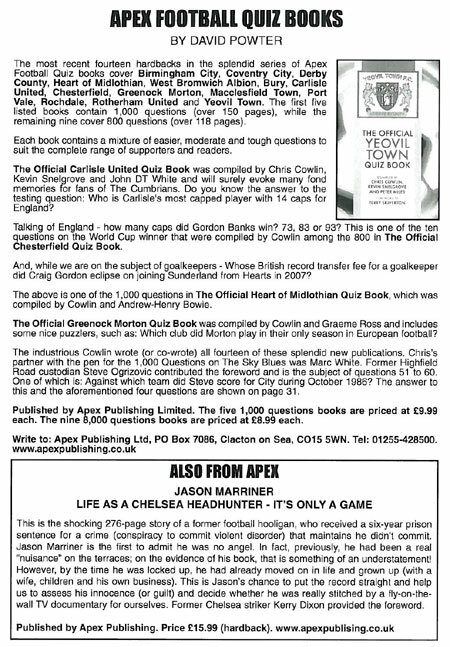 I would like to thank Chris, Kevin, and John for asking me to write the Foreword in this Official Rochdale AFC Quiz Book. Having has the privilege of being able to read the book in advance, I was surprised and pleased to realise how many questions I could actually answer, until I worked out the reason why. My first game watching Rochdale at Spotland was back in 1960, and though we were formed in 1907 we did not enter the Football League until 1921, which means that I have being watching Rochdale for nearly half the time of their existence and more than half their time as members of the Football League! I was lucky enough to watch our team through the great League Cup run in 1962 and see us win promotion to the old third division in 1968-1969, distant but still vivid memories of my teenage years. I also watched them through the dark days of the mid seventies when the club came close to extinction and Spotland looked like the national stadium of a third world country on a bad day. But we have survived and today we are looking forward to what I believe could be the greatest time for Rochdale AFC and there is no better time to support the Dale. This is where this book is absolutely fantastic, because not only is it a quiz book, but it is in fact a ‘potted’ history of Rochdale AFC from 1907 right through to the current day. It is full of facts and figures from our past put into a great entertaining format. For the younger followers of our team this is a great opportunity to brush up your knowledge and impress your mates. This is a book you will not want to be without, you can test your dad or granddad with his knowledge on the Dale, or take it to the pub for some fun with your pals, or just improve your own knowledge of the club. I took it as a great honour when I was asked to write a foreword for this quiz book. Although my Dale-watching life only goes back to 1982, I have taken a great interest in the club before then and marvel at tales from older supporters about the exploits of the likes of Reg Jenkins, Dennis Butler, Steve Melledew and Bob Mountford. There are so many games and so many players I wish I’d seen. The 1962 League Cup Final; the promotion-winning game against Southend in 1969; the Coventry FA Cup tie in 1971; and even the desperate cup exits to the likes of Northwich, Droylsden and Altrincham. But I too have experienced many memorable moments in the last 27 years, some which I will never forget. Winning at Burnley with nine men; playing Manchester United at Old Trafford; scoring seven goals at Stockport; the Darlington play-off second leg; and, of course, seeing Dale at Wembley. The club may not have been successful in my lifetime and I’ve often wondered if it’s all worth it, but your football team is in your blood and I wouldn’t change those experiences for anything. Since becoming Programme Editor in 2001, I have carried out lots of research where I always find snippets of news and information that I never knew before and which enhance my knowledge and understanding about the club even more. Some of this information drifts from my thoughts, but there are other things which remain imprinted on my mind. I know I’m not alone in this and at Spotland on any given matchday you will find plenty of knowledge and memories, however recent or distant they may be. Much of this knowledge will be necessary when attempting to answer questions in this quiz book, regardless of your age or Dale-supporting experience. You can use the book to satisfy your own curiosity or to generate much debate and competition among your friends, especially on long away trips. I sincerely hope you find something in the book that suits you and that you also learn even more about the club and its past. SPOTLAND will play host to FA Cup runners up Everton next month as part of their pre-season programme. Keith Hill’s team will take on David Moyes’ side on Saturday 18 July, 3pm kick off. The game comes just two days before Dale entertain champions Manchester United. The first pre-season game takes place on Wednesday 15 July when the team travels to Radcliffe Borough. After the eye-catching fixtures against the Premiership duo, Dale take on Blackpool at home on Saturday 25 July. Then it’s two games on the road with trips to Rossendale United and Southport. Dale fans can test their knowledge with a new quiz book about their favourite team. Rochdale chairman Chris Dunphy and the clubs programme editor Mark Wilbraham have written the forewords to the Official Rochdale AFC Quiz Book, which is now available to buy in various bookshops in the Rochdale area as well as the club’s official store. The book contains 800 questions to test supporters’ knowledge on all aspects of the club, from managers, players and opponents to memorable matches, scores, victories and defeats. 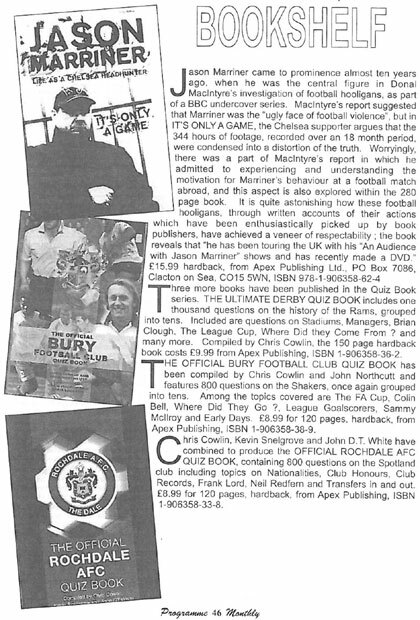 Mr Dunphy said: "This book is absolutely fantastic, not only is it a quiz book, but it is in fact a ‘potted’ history of Rochdale AFC from 1907 right through to the current day. It is full of facts and figures from our past put into a great entertaining format. For the younger followers of our team this is a great opportunity to brush up your knowledge and impress your mates." He added: "This is a book you will not want to be without, you can test your dad or granddad with his knowledge on the Dale, or take it to the pub for some fun with your pals, or just improve your own knowledge of the club." Supporters who think they know Dale inside out are able to put their knowledge to the test with this book. They may find one or two surprises in here! No Rochdale AFC fan should go to a Rochdale based pub quiz without having a read of this book first.